Boats Ibiza | Ibiza's most trusted boat hire, charter & yacht rental co. Boats Ibiza is your number one resource in Ibiza and Formentera for great value boat hire, yacht charter and watersports. We make renting a boat or chartering a yacht in Ibiza simple, straightforward and great value for you. In fact, from the moment you get in touch with us, you’ll receive a personalized, bespoke service, maximum flexibility and the best prices around. We’ve been established in Ibiza for 12 years and as of 2018, are the only boat hire company in Ibiza to have been awarded the TripAdvisor Certificate of Excellence for 5 years straight. This distinction led to Boats Ibiza qualifying this year (2018) for the incredibly prestigious TripAdvisor Hall of Fame. With Boats Ibiza, you’ll find the best deals on the Ibiza boat rental market delivered directly to you – just check out our price promise and psst, our last minute deals are legendary! 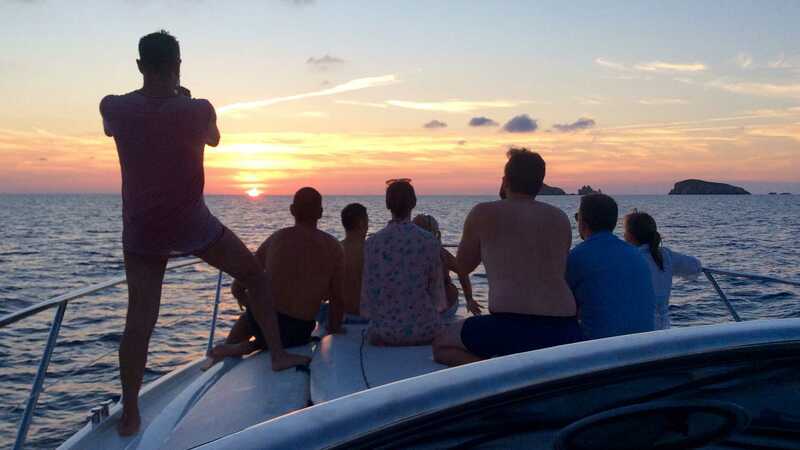 In short, making your Ibiza boat trip a truly memorable occasion is our top priority, be it half or full-day Ibiza boat hire, a sunset trip, a long weekend or a week-long boat or yacht charter. Whatever your budget, wherever you want to go and whatever you want to do, we’ll make it happen. From the first moment you contact Boats Ibiza, our friendly, efficient enquiries team will be on hand to guide you through the selection process. Just let us know your budget and the type of boat, yacht or kind of day you’re after and we’ll give you a no obligation quote listing our best Ibiza boat hire options, handpicked for you. Once you’ve decided on your perfect boat charter, we’ll guide you through our straightforward bookings and reservation process. Easy! We know it’s the little things that make Boats Ibiza stand out from the rest. Let us organise all the finer details of your trip at no extra charge. Stags and Hens and are a speciality as are large groups and events! Want a Champagne reception? Catering? On board entertainment or an Ibiza / Formentera beach restaurant booking? We’ve got you covered, just ask! Want to experience the thrill of wakeboarding, water-skiing, flyboarding, mono-skiing or just for fun, being whizzed around on our inflatable donut? Our qualified, expert captains can teach you all these exhilarating watersports using top quality equipment, whatever your level. If snorkelling in marine-rich waters of a secluded cove or wreck is more your scene, Boats Ibiza can provide all the essentials necessary for an underwater adventure you’ll never forget. There is no such thing as a ‘typical day’ when you book with Boats Ibiza. It’s always your day and that means the best boat, route and itinerary tailor-made for you. Our commercially qualified captains are real local experts, so you can simply relax and take advantage of your Captain’s huge knowledge of the Ibiza and Formentera coastlines. Our Captains will tailor the day according to your wishes. Let them indulge you in the Mediterranean’s best bays, beaches and restaurants. Some of our popular locations include leisurely lunches at Cala Bassa Beach Club, afternoons in Cala Jondal’s uber-chic Blue Marlin or cool Mojitos at Ses Salines’ Jockey Club. Others prefer to order fresh seafood and dine with their feet in the sand at Formentera’s legendary Juan Y Andrea. We know all the best bars and restaurants on the islands, just check out our guide. Perhaps you’ve dreamed of watching an Ibiza sunset at the majestic Es Vedra or from a romantic secluded cove with a cool glass of Champagne and your favourite person? Or maybe partying on your very own privately chartered yacht in front of Café Del Mar, whilst your personal DJ plays chilled Balearic beats? Whatever you desire, we’ll provide the perfect day. Ibiza and Formentera have become a popular playground for the rich and famous. A few of our better-known clients include: Nicole Scherzinger (Pussycat Dolls), Alesha Dixon (Mis-teeq / Strictly Come Dancing / Britain’s Got Talent). Then there’s Dizzy Rascal, James Hill (winner of Celebrity Big Brother 2015) and Max Morely (winner of ITV2’s Love Island 2015). Also Fearne Cotton, Abbey Clancey/Crouch, Example, Carl Fogarty, The Kooks, Kelly Hoppen (Dragons Den), The Claxons, Laura Whitmore (MTV), Pendulum, Professor Green and Vampire Weekend. All Boats Ibiza clients! Enjoy a fabulous day out with Boats Ibiza. Half day boat trips start from just €445 for a group of 9! That’s less than €50 each including fuel and unlimited drinks. Affordable huh? What are you waiting for!? To reserve your perfect date we recommend booking in advance. For last minute bookings, we may offer a special reduction in price, ask us! Live every moment of your Ibiza holiday to the full with a Boats Ibiza charter - the only boat hire company in Ibiza in the TripAdvisor Hall of Fame!